2. If no jeweler is available then use the strip of paper method ,(described below the ring size chart ),to give me an idea of the size. 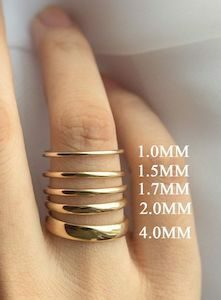 I will need it’s total length since each ring is different depending on width and thickness. 3. For Your Information…Fingers can easily shrink and expand 1/2 size in a day due to water retension, body temperature, hand usage, room temperature and from prone to standing…among other factors. This ring size chart is for my reference and only a rough gauge. It is caculated for a wide band ring of 1mm thick with a taper and dome...there are different measurements depending on the ring style!!! This chart is relatively accuate but the finger measured at a Jewelers, in ‘normal’ conditions is still the only true way! Take a thin strip of paper , the width of the desired ring , ….1/4″ , 3/8″ etc…. Wrap it around your finger snugly,(not tight or loose) , and mark where the end comes around. Lay the strip down on a ruler, either in inches or millimeters, and convert that length to the ring size on the chart. Wider rings or strips of paper, ( 3/8″- 1/2″ ), will give a slightly different measurement, larger sizing. There are several ways of measureing ring sizes and many charts that do not agree with each other. There is a difference between a thin band and a wide band gauge measurement. 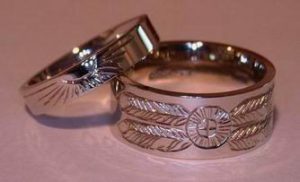 For Example: If you measure a size 8 in a thin band you will probably be an 8 1/2 for a 3/8″ wide band ring. 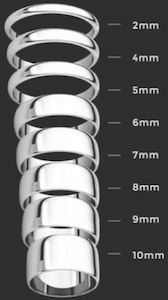 Various Ring widths – 1mm to 10mm – obviously some of these do not allow for certain symbols, also, if there are stones they usually require a drilled hole completely through the band and this could weaken the integrity of the band’s strength.